Happy Canada Day everyone! I hope you all had an amazing one, whether you are Canadian or not. We spent ours as a family (with Granda and Grandpa in town). We enjoyed the sunny weather, took the boys to the Parade over in Coleman, AB (a pleasant surprize). And unfortunately, spent most of the rest of the day packing house. We're on the move again today. 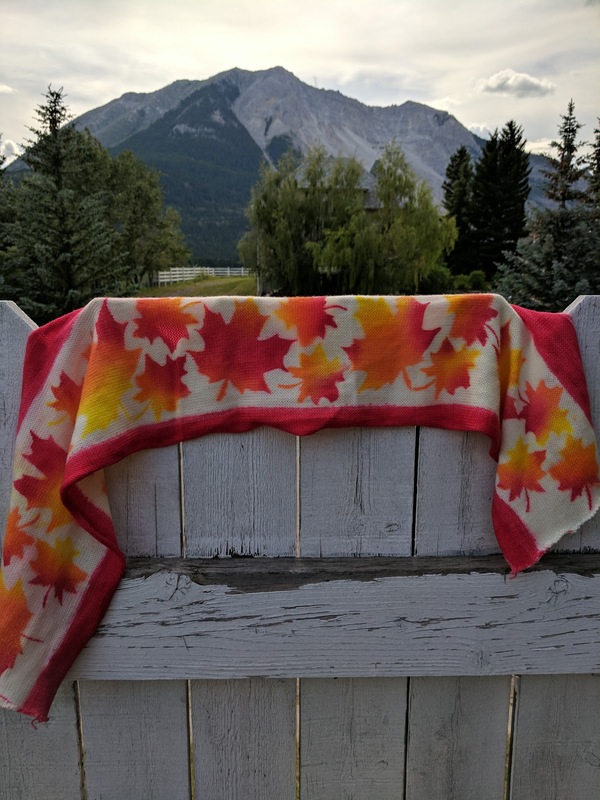 Goodbye beautiful Crowsnest Pass mountains! We'll miss you. Hello Strathmore (which I am trying to be excited about.... at the very least we're super close to Calgary). It'll be a while before I can take pictures of yarn with backdrops this beautiful again! Anyways, to get ready for packing up this week, I decided I wanted to use up all of my liquid dyes. The condiment squeeze bottles they were in were cheaper than expected, and also (probably related) leakier. 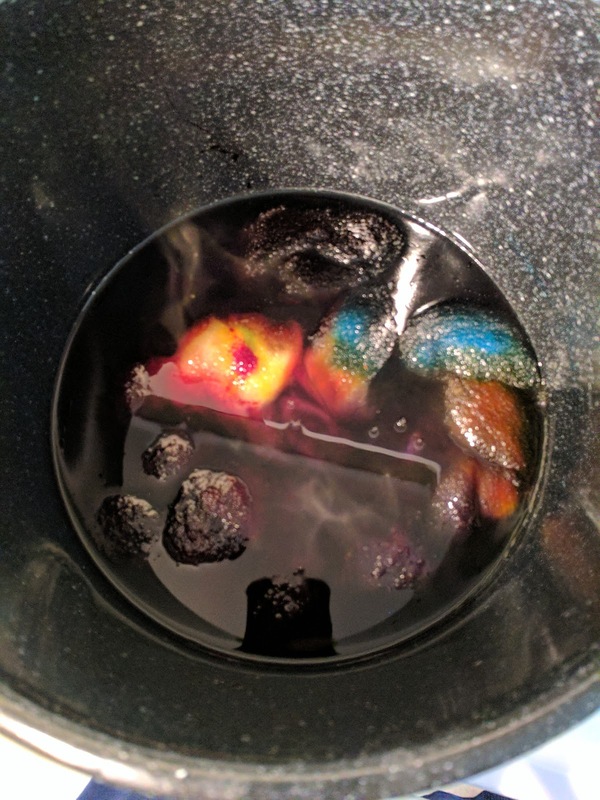 So I figured it was best to just go ahead and use the dye. 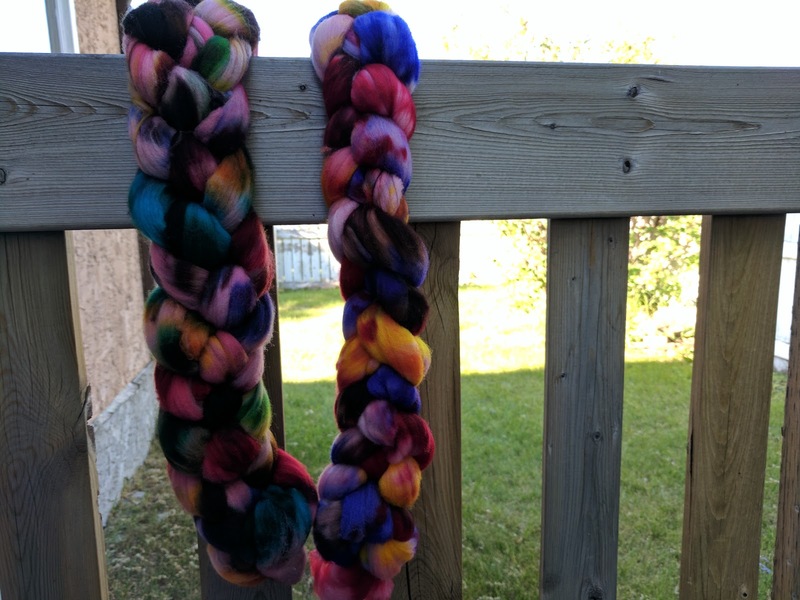 Plus Tour De Fleece is underway, so who doesn't need more beautiful dyed fibre? right? The dyes I had to work with were all from Jacquard. You can't see the turquoise or the Aztec gold in the picture, they are the two in the back. Oh and that fire red. Either it didn't want to set at the same conditions as the rest, or it just wants to bleed like a mo fo (probably both). 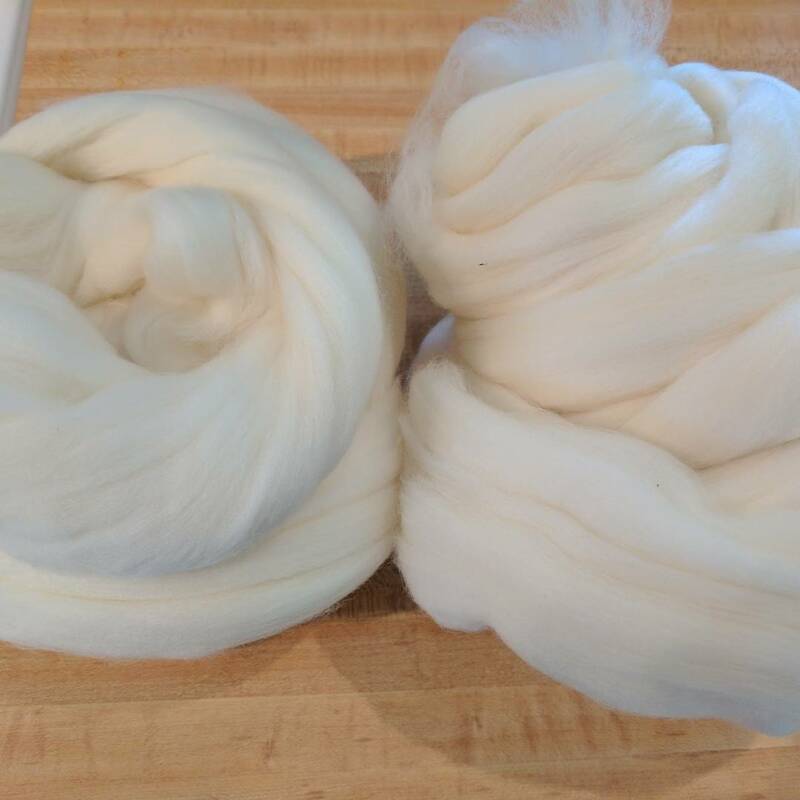 The fibre was two 120g lengths of superwash treated 100% Merino Lambswool, that I pick up from Shuttleworks before they closed last year. I've dyed this fibre before and it takes up dye beautifully. It also just wants to fall apart. The fibre wants to stick to your hands (or anything else for that matter) every time you handle it and the braids come out of the process a little worse for wear looking. Fine for hoe use, not likely something I'd sell. 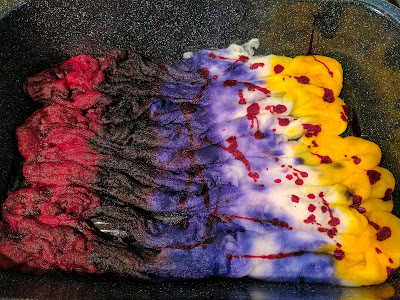 So maybe I'd better sharpen up my dyeing process for roving. Annnyways. The first braid I dyed in a roasting pan in the oven. Soaked it in water and vinegar first (for maybe 10 min only) and then let some of the water drain out before aranging it in the pan for dyeing. Fire red at one end, then black, violet, less violet, and sun yellow. splattered all over with more red. The second braind I dyded in the pot. 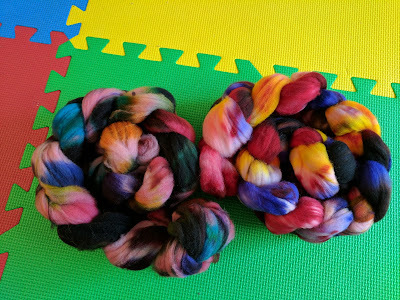 I losely braided the firbre before soaking, and left it braided so some sections would be less accessable to the dye (a great idea when you're being heavy handed with dye). Terrible picture I know. but literally all I did was apply everything that was left of each dye, each in it's own spot, evenly distributed around the pot. Oh and I tried something else new this time. I spun the water out of my braids in the washer before hanging them to dry, and I must say I'm a convert! 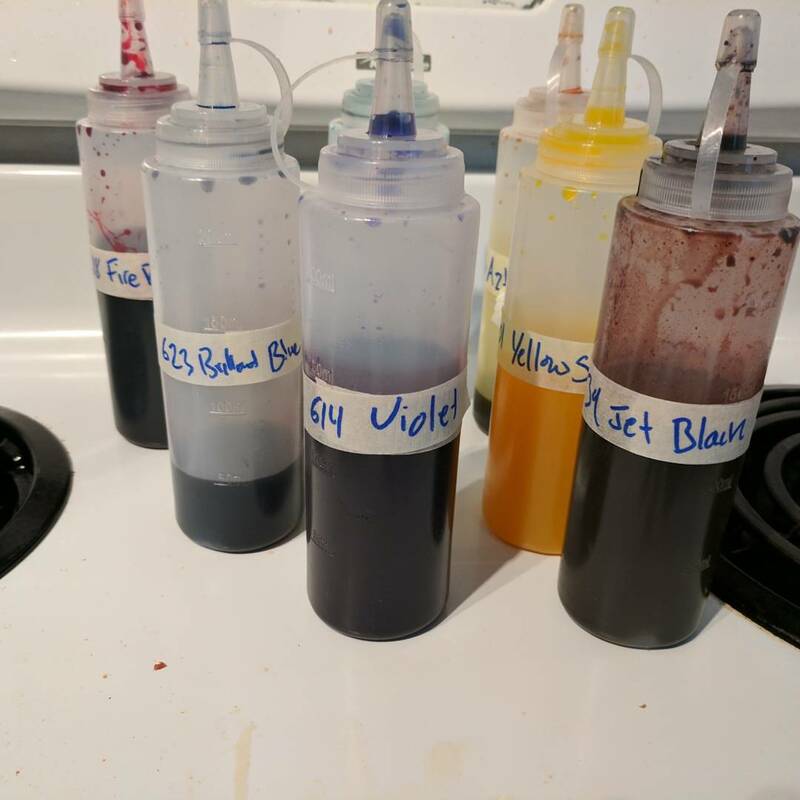 would have tried it sooner, but when I was doing a tonne of dyeing back in 2015, I only had access to coin opperated laundry. Here are the braids. The one on the left came out of the pot and the one on the right came out of the pan. You can see how the fire red bled into all of the white spots, but the braids still came out pretty. And here they are outside, trying to show the colours more truly. You can also see these braids on the Day 01 video of my 2017 Tour De Fleece, on YouTube now. Plus all the other fibre I'll be spinning this month, and a section on carding and spinning Shetland Fleece for a Lopi style yarn.